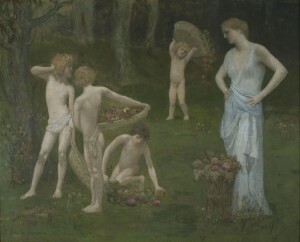 L’Automne is typical of the artist’s mature work, a poetic pastoral scene featuring children gathering fruit under the attentive eye of a woman draped à l’antique. This was among fifteen of the French master’s paintings and drawings on view at the Armory Show. Most came from the collection of the New York attorney John Quinn, who was a major contributor to the exhibition. L’Automne was lent by the Chicago collector Martin A. Ryerson, who was a founding trustee of the Art Institute of Chicago and one of its most important donors. The Armory Show was not designed purely for shock value; its organizers also sought to educate viewers in the latest styles. Situating the newest movements within the history of art, the Armory Show traced a modernist trajectory originating from nineteenth-century French painting. As one of the few artists admired by conservative and avant-garde artists alike, Puvis played a pivotal role in this didactic mission, becoming an interpretive lens through which to understand the innovations of modernism. Though praised by New York critics as “highly spiritual” and possessing “noble vitality,” Puvis’ work did not travel to Boston or Chicago, where his reputation was already well established in public and private collections. The exhibition was considerably smaller in both cities and focused increasingly on the most radical work in the show. Scholars had previously misidentified this painting from the Armory Show as The Fisherman’s Family (1887), which Ryerson gave to the Art Institute of Chicago in 1915. But after extensive new research, the art historian Aimée Brown Price, who has published extensively on the artist, discovered it in the collection of the City College of New York. The criticism is from “International Art,” The Evening Post [New York], February 20, 1913, 9.